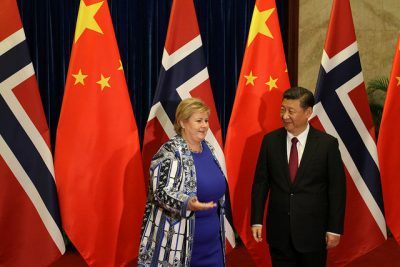 In the statement attributed to “the Spokesperson for the Chinese Embassy in Norway,” China claimed that it “always respects the sovereignty and national security of Norway, and has never interfered with Norway’s internal affairs.” It went on to state that “China poses no threat to Norway’s security,” noting that it was “strongly dissatisfied with and opposed to” PST’s threat assessment and remarks made by PST chief Benedicte Bjørnland. She specifically noted how China has an intelligence law that compels both private companies like Huawei and individuals to cooperate with Chinese authorities if asked to do so. Norway must thus be careful, PST warned, in any business dealings with Huawei, especially those involving development of the next 5G telecoms network. Bjørnland was firm in her presentation of the threat assessment that her agency presented on Monday. Norway is one of the world’s most digitalized societies, she noted, and anything that’s been digitalized can be subjected to attack. The large public health agency Helse Sør-Øst was attacked just year, and sensitive patient data stolen. Some experts say various companies and institutions come under attack every day: “The methods are cheap, efficient and in constant development, and the attackers steadily find weaknesses they can exploit,” Bjørnland said, urging all Norwegians and especially government authorities and companies like Telenor to be on the defense at all times. Telenor was clearly put in an awkward position by PST’s detailed and strong threat assessment, since it has done business with Huawei for years. “Huawei is an important partner in various cooperations,” Telenor spokesperson Caroline Lunde told state broadcaster NRK. Huawei helped developed Norway’s 4G network and has been involved in the pilot project for the 5G. “We will analyze what these (threat) evaluations can mean for us, our customers and society,” Lunde said, adding that Telenor and other players in the telecoms industry like Telia and Ice Net are currently “in dialogue” with Norwegian authorities about the 5G project. Telenor also remains majority-owned by the state. The Chinese government, which only recently thawed a six-year diplomatic freeze it launched against Norway over the Nobel Peace Prize to Chinese dissident Liu Xiaobo, is always sensitive to any threats to its authority and may be especially sensitive now given the slowdown in its economy. Last year’s economic growth was the lowest in 28 years and China is under pressure from the trade war launched by US President Donald Trump. India is coming on strong as an economic rival, with its democracy endearing itself to many countries around the world including Norway. China clearly feels a need to protect large international Chinese companies like Huawei, while at the same times its authoritarian system and human rights abuses can be a liability to Huawei, which acknowledged on Monday that it was “in a difficult situation.” Huawei claims it has never shared information with Chinese authorities, but it remains unclear whether it never will have to.